Thursday always means a great get together over at Between Naps On The Porch. 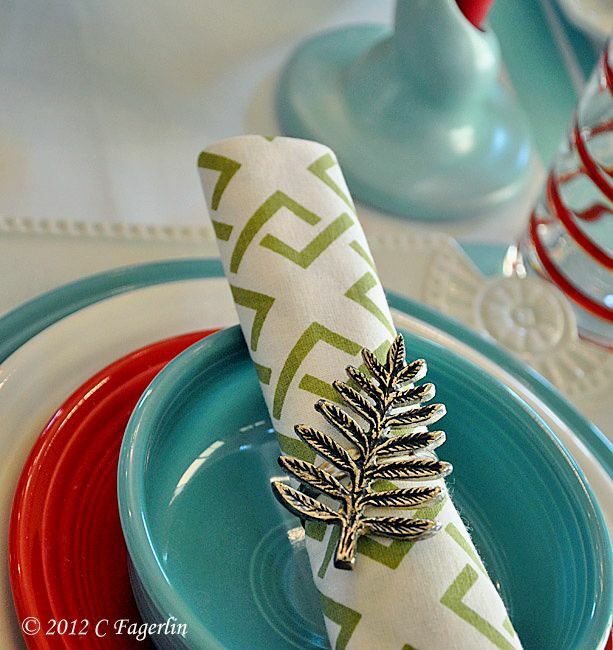 It's time for Tablescape Thursday, come join the fun! 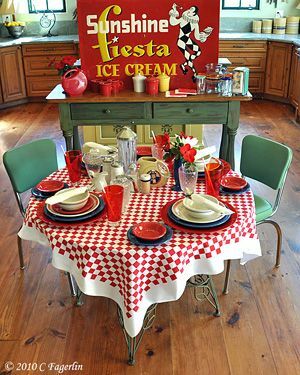 Vintage tablecloth shown with Post 86 Fiesta in Turquoise, Scarlet and White. 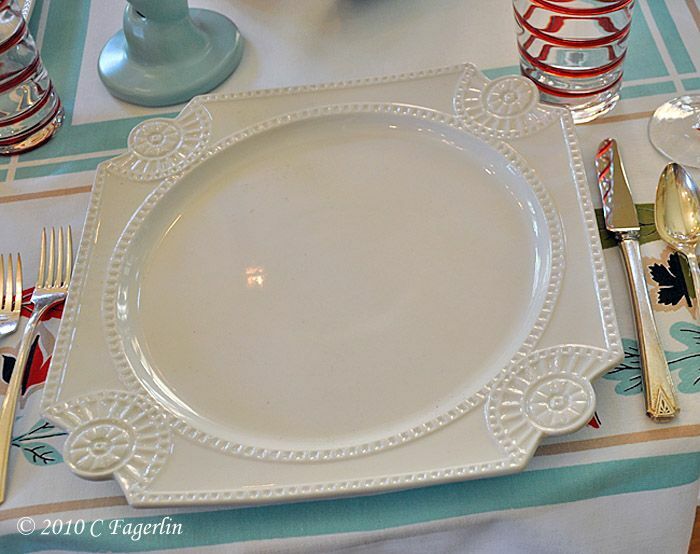 White chargers are Made In China, glassware from Pier 1, napkins from Home Goods. turquoise accessory pieces are vintage Homer Laughlin. 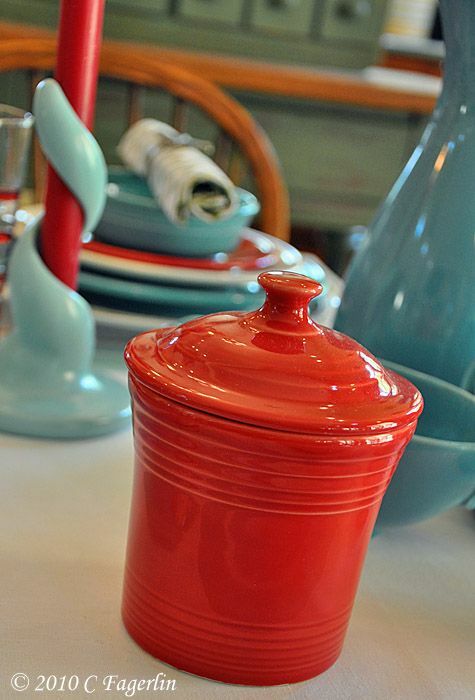 Recently released Fiesta Jam Jar in Scarlet. 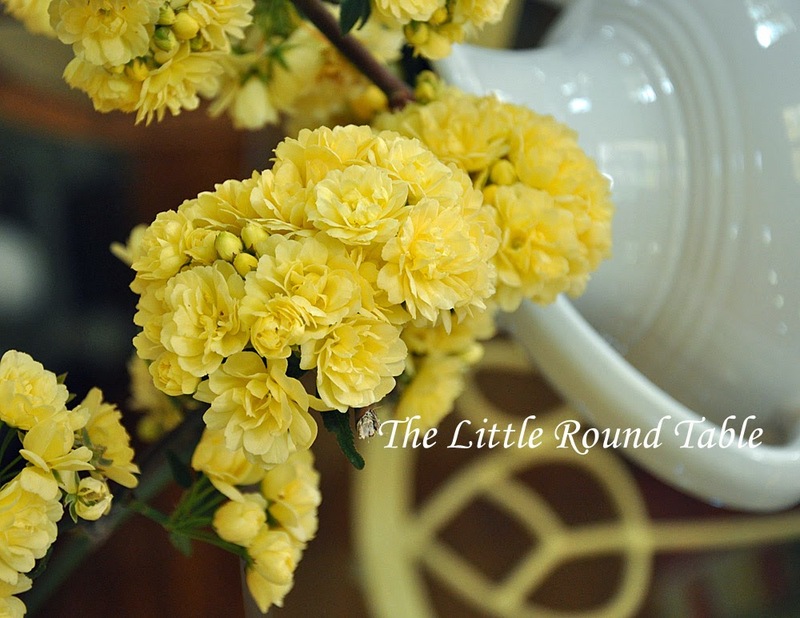 Thanks for stopping by to see this week's tablescape, see you again soon I hope! 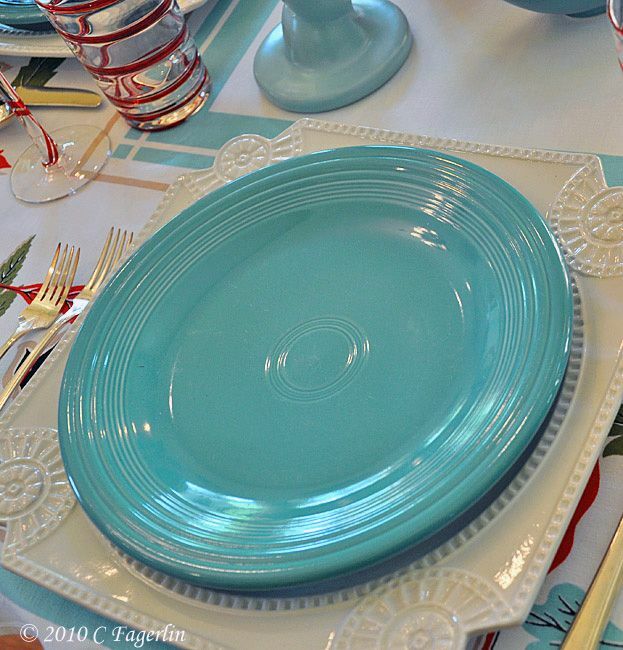 Sooooo CUTE...love the colors that you used...my fav item is that "COOL" vintage tablecloth...I have a love for vintage linens! 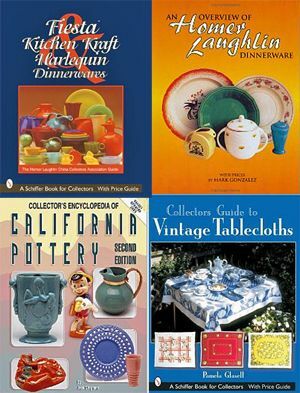 Coming by from Tablescapes Thursday. Wow! So festive. 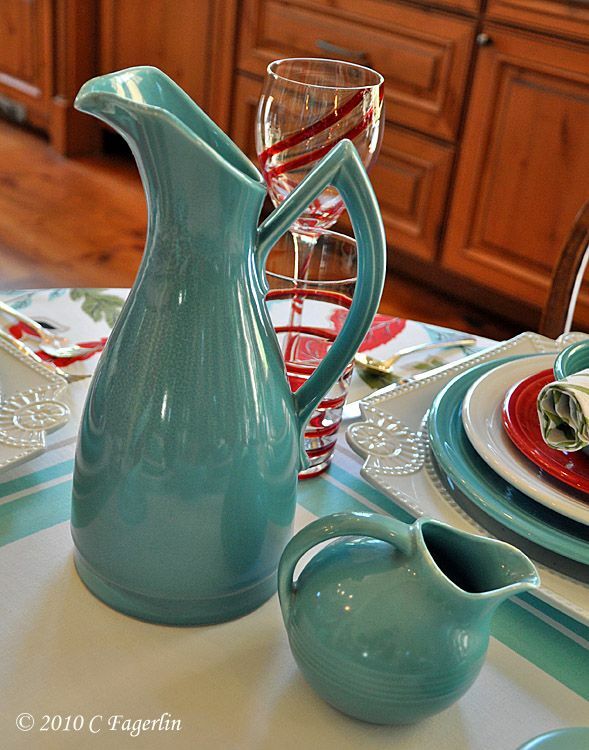 Love the green-blue pottery! What a great color combo! Those red swirled glasses add just the right touch, too! 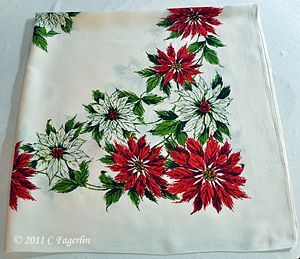 SO wonderful with this tablecloth! Such a great color scheme! Those chargers are just beautiful! Just beautiful. I love the addition of the chargers. They really set it all off. The glassware is fun and your Fiesta is gorgeous as always. 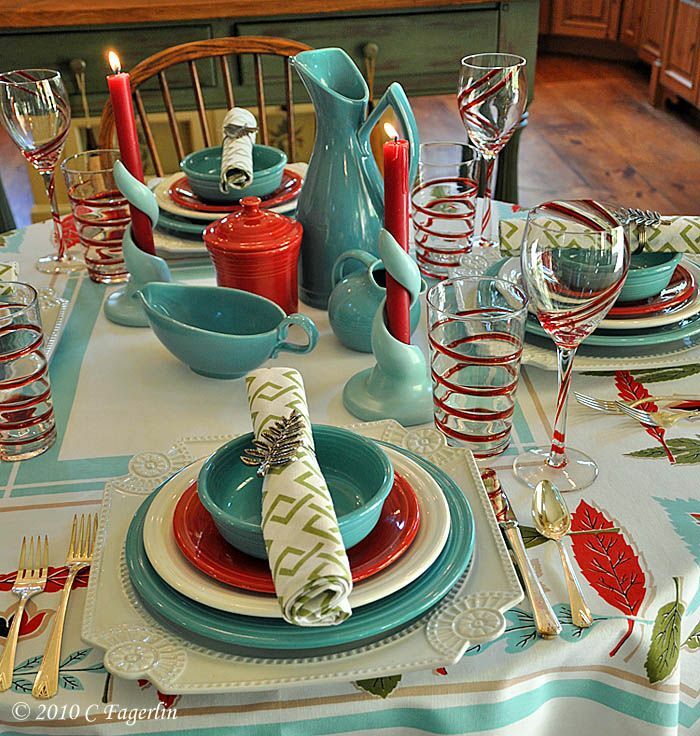 What a bright, colorful, and festive setting!! LOVE the charger plates! Really pretty. 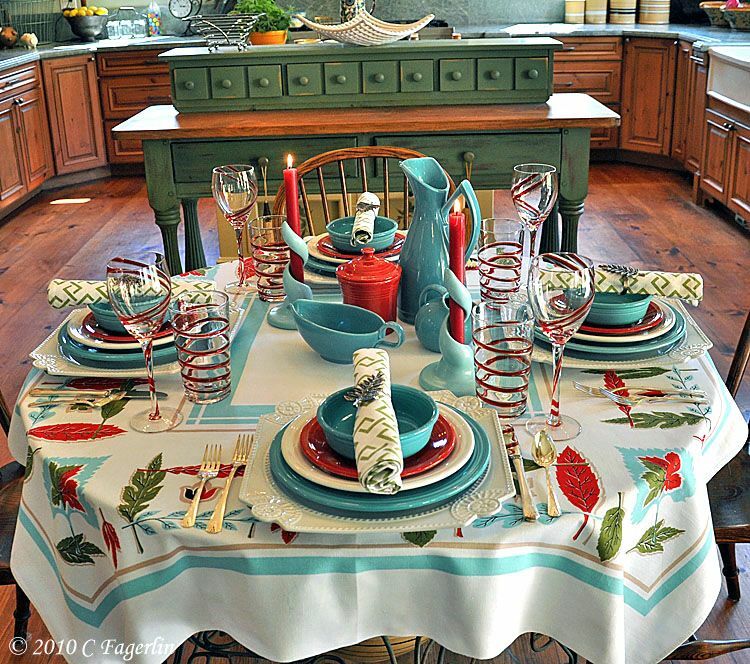 I just love visiting your tablescapes! Aqua gives such a snap to other colors, doesn't it? I love it with red. Beautiful job! 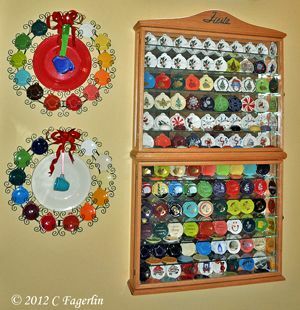 It seems like you really enjoy setting your table and using your collection in creative ways! Perfection! 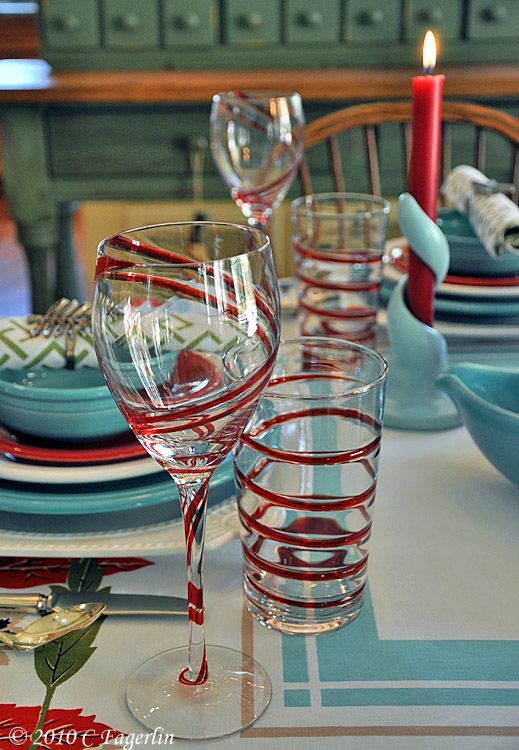 Love the colors, the napkins and napkin rings and the glasses with the red stripes! 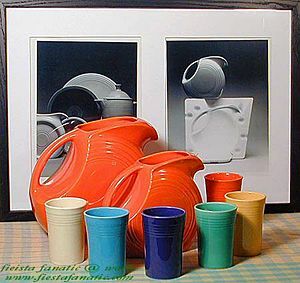 The fiestaware is just gorgeous! 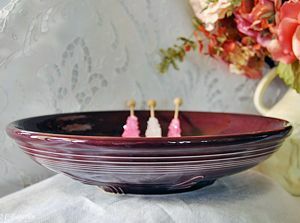 Stop by and enter Centerpiece Wednesdays on my blog today. 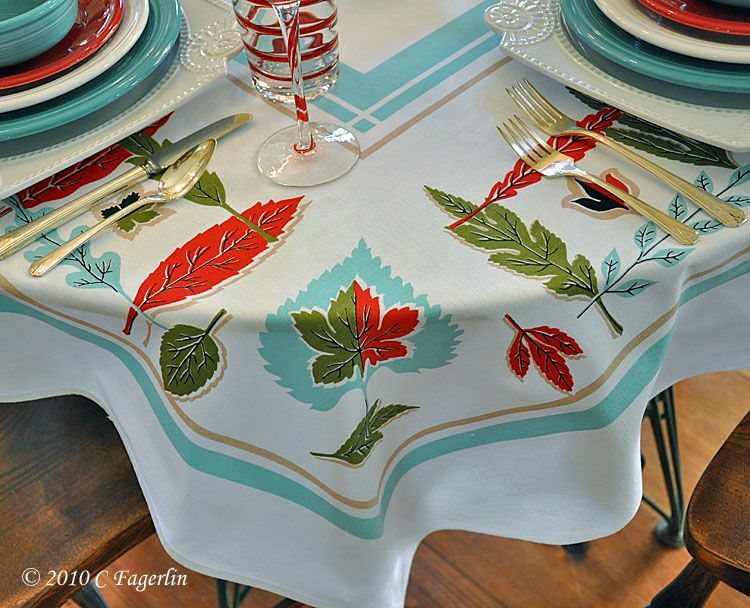 I just love that tablecloth. I think I say that every week. The aqua and red look great together. Those chargers are gorgeous! I can't believe I am looking at turquoise and red together. I am decorating my guest room in those colors! I love everything you have selected and as always you do such a wonderful job with your displays. The chargers really are pretty with your dishes. I love visiting your blog on TT. 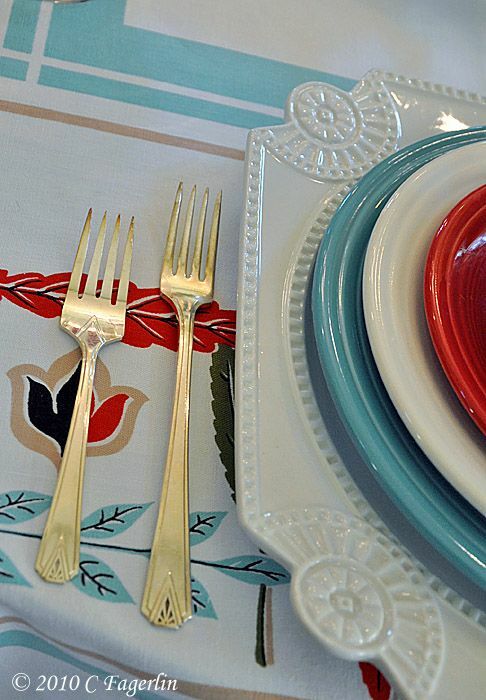 Your tablescapes always wow me, and this one is no exception. You inspire me. I love your eye for color and design! What great collections you have. I especially love your red swirl glasses! I have to spend more time on your blog, maybe you'll answer all the questions I have! Wow, I love all the color in this table. 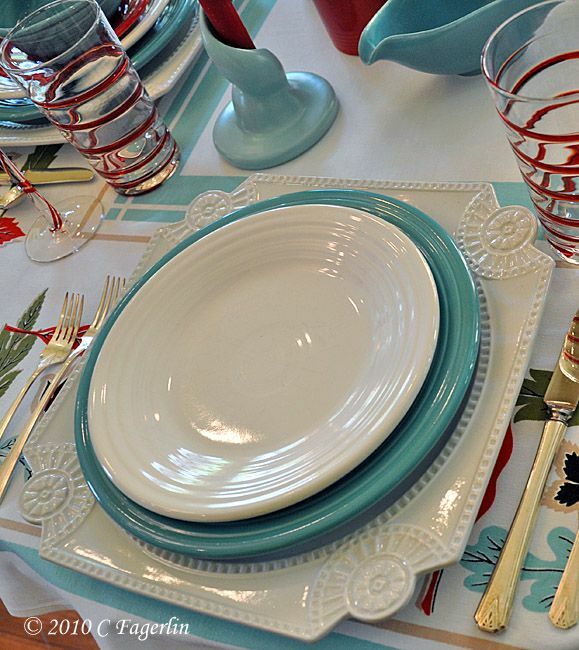 The dishes are really pretty and the tablecloth is beautiful, as always! You've topped yourself this week Candy. 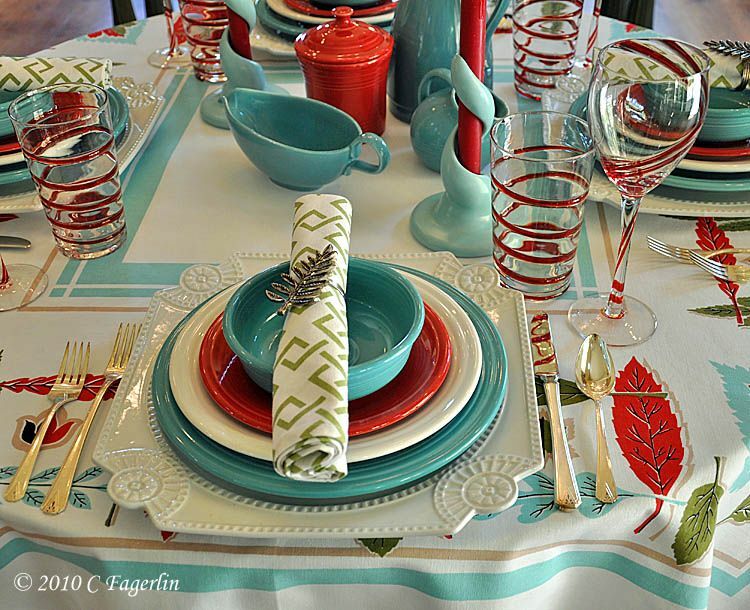 Those colors are so contemporary and the tablecloth is divine! Thanks again for sharing your lovelies with us. Oh my gosh, what a FUN! tablescape. 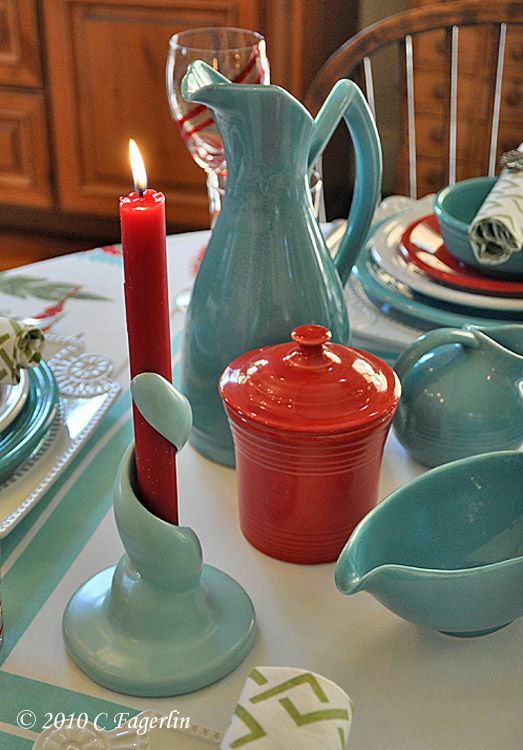 I love the color scheme, and all the swirlies, on the glasses and the candlesticks. There is a lot of visual movement and energy going on here. Just gorgeous! 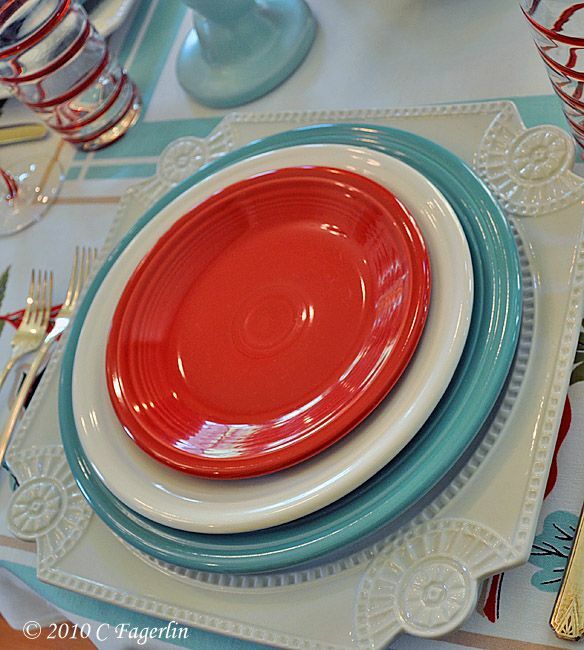 Love this colorful tablescape! 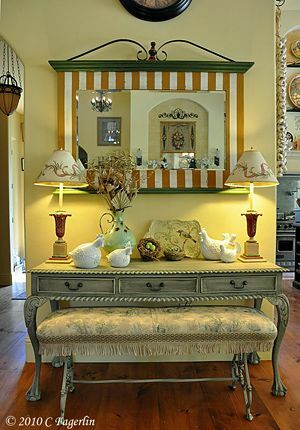 You always put together a lively and colorful combination for us to view! Great job! Oh my goodness, this is so amazing! I love it,love it,love it! 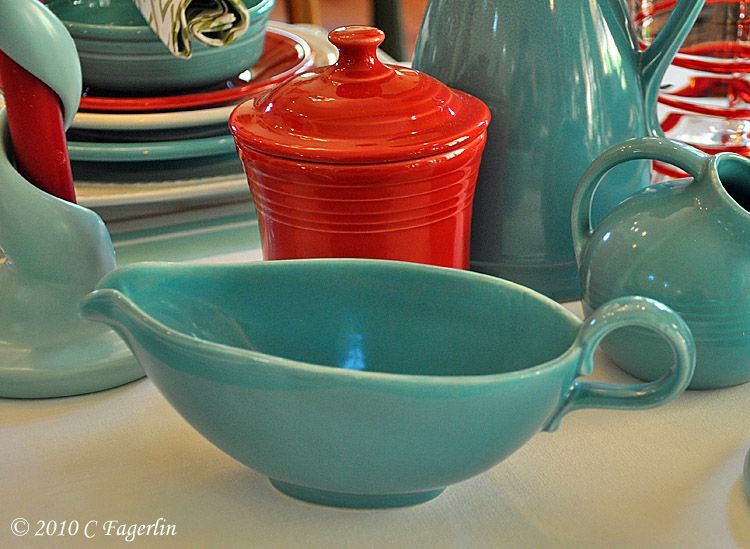 I wish I had ALL these dishes, they are just to wonderful! All my favorite colors too! Thank you all for your generous praise! 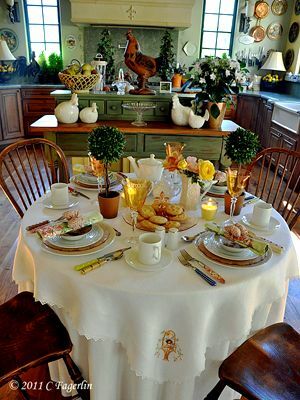 I just love everything about this tablescape! You have a wonderful eye for styling. Thanks for sharing, and I look forward to what you will do next! 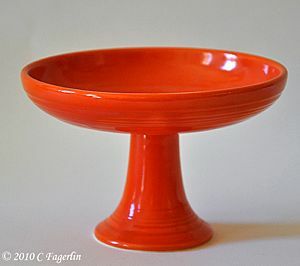 This table is sooo......perfectly updated retro!! 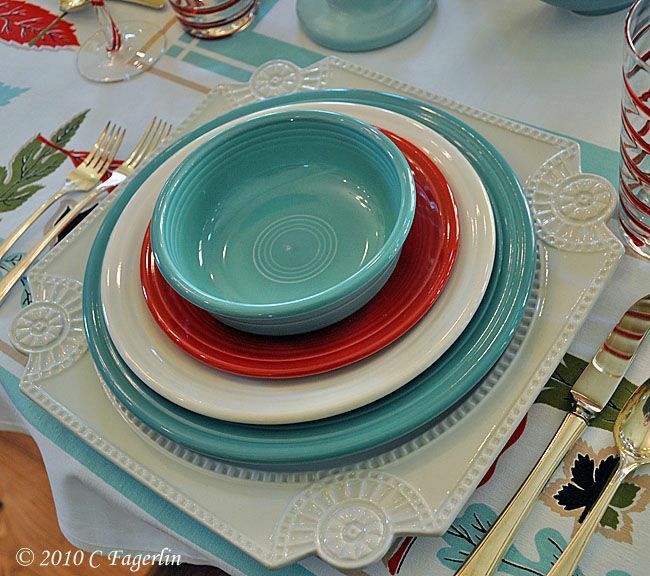 Candy..you always have such great tablescapes and I always love the fiesta!! That said, this has to be my favorite!! 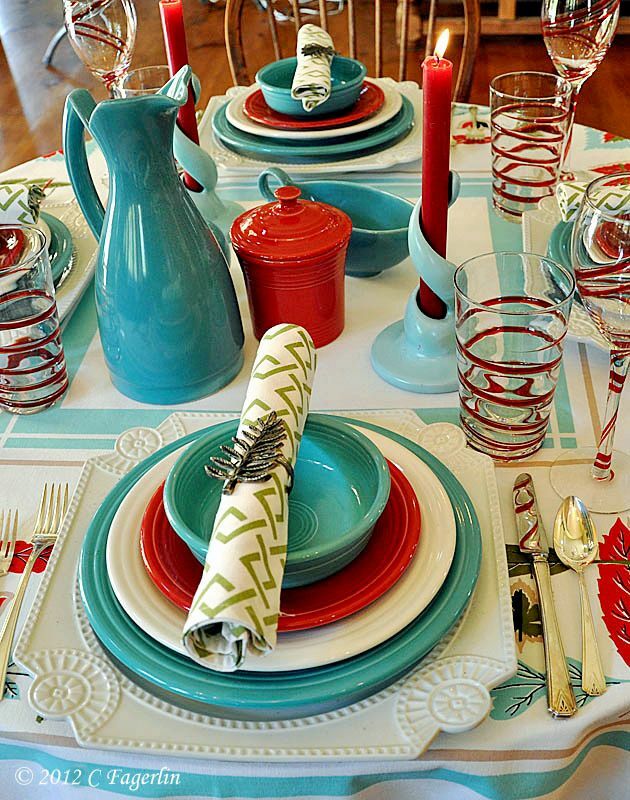 I love the combo of red and turqoise...so retro and gorgeous!! Hello Candy~I've just strolled in for my first visit...I've enjoyed taking a peek around. Your blog is so beautifully inviting.We share similar tastes for so many of the same creative design elements. What a beautiful setting! I love how the colors marry so well. This has a wonderful South West ambiance. 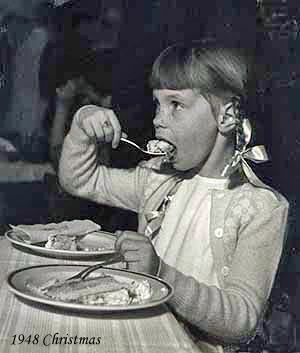 It's wonderful how inspiring blog friends as yourself can be, that's why I love returning the gesture, by sharing cooking or DIY inspiration too. I've bookmarked you in my favorites. You have the most wonderful tables. 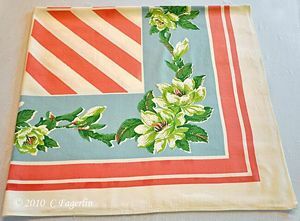 I love vintage printed table cloths. 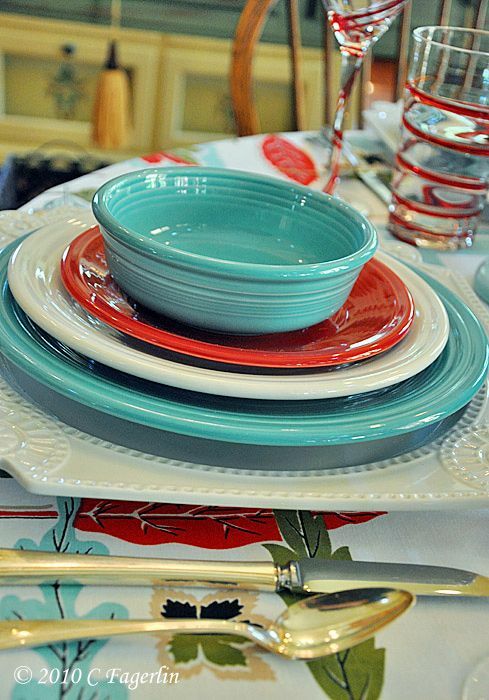 I just adore all your fiesta ware. 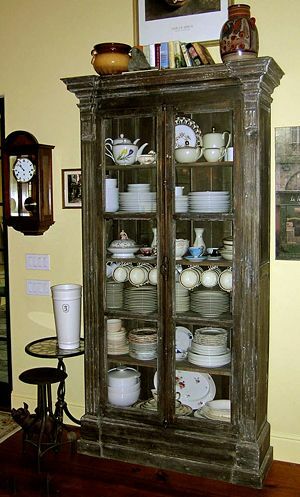 I don't think I have one piece (funny for a 'collector' of all things dish). 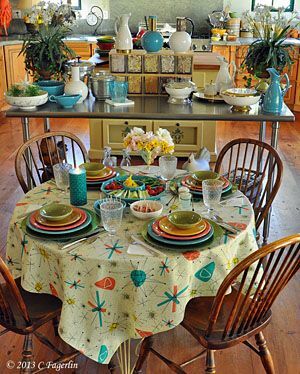 I adore the way the dishes and the tablecloth prints always coordinate. So inspiring. 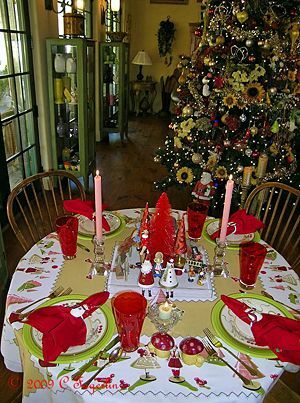 Oh...this is so beautiful...my family would love it if I could set the table like this! Your photography is stunning. Your pictures are SO crisp and clean and focused - what's your secret? LOVE these colors together! Gorgeous table! 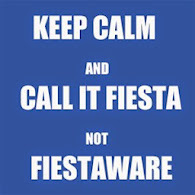 You know you've got me looking for fiesta!! Your tablescape is once again out of this world.. beautiful. 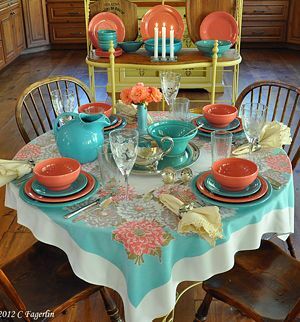 That is gorgeous, how I love the color scheme and the linens are marvelous! GORGEOUS! Blue & Red, my favorite colors. 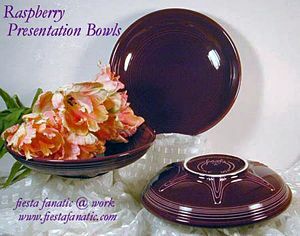 Your dinnerware is SPARKLING, it is so shiny and pretty. 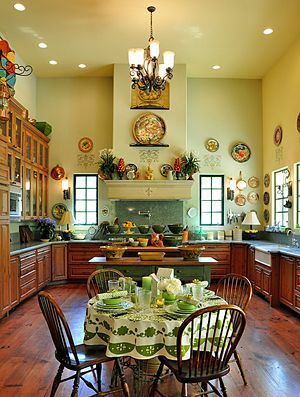 And your kitchen is all the more beautiful! Thanks for sharing. I like how this table is both warm and cool, with hints of the next season to come. The Deauville looks especially nice with those chargers. So very "retro", although I think at this point the term is about worn out from being so over used. Things That Inspire - Thanks so much for the compliment. MY SECRET is my camera, which should get all the credit, not me. It's a Nikon D90 with the standard kit lens. It's my fairly new (5 months or so I think) best friend! And a special hello to two of my favorite dish buddies, Saarin and Daphne! "Hello!"